In one of these stylish floor-length evening dresses by Clarisse, bring the elegance to prom night, or any other formal event. In this assortment of designer dresses for prom, you will find an array of designs, ranging from timeless grandeur to fun and flirty fashion-forward styles. Contemporary two-piece prom dresses with bead-accented bodices provide a youthful vibe, while classic princess-cut curve-hugging gowns for prom help create a shapely silhouette. Ideal for proms, military balls, or even pageants, Clarisse dresses combine trendy details with refined sophistication, making them a winning choice for confidently making your grand entrance or taking center stage. Whatever your personal style, explore this collection of designer dresses for a figure-flattering look at your next special occasion. Why Wear a Clarisse Evening Dress to Prom? 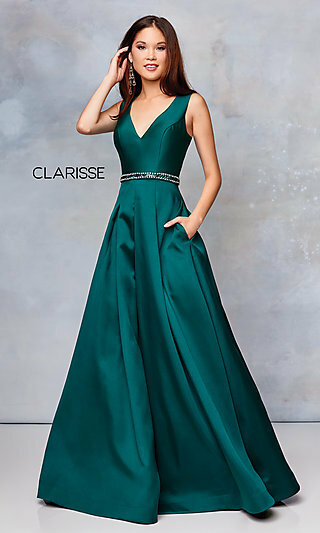 If you’re looking to paint a picture of poise and grace, while staying up-to-date with current fashion trends, slip into a long prom dress by the designers at Clarisse. Effortlessly blending refinement with modern features, this collection of designer gowns for prom offers figure-flattering looks that are ideal for prom 2019. Here you will find the latest in vogue floor-length designer dresses for prom, including off-the-shoulder dresses, floral-print dresses, and exciting two-piece dresses, as well as timeless strapless dresses and ultra-feminine corset-back dresses. Looking for the best of both worlds? 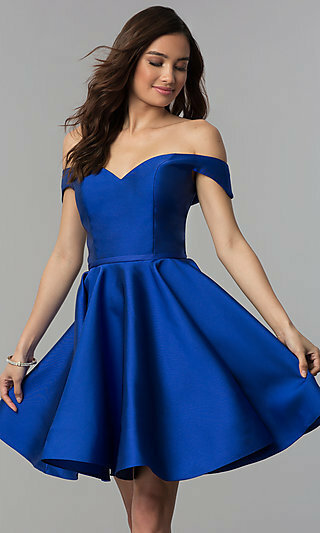 Try one of the off-the-shoulder long prom dresses with a sweetheart neckline and pleated satin a-line skirt, or one of the formal evening dresses adorned with an illusion-lace bodice and soft, flowing chiffon skirt. Whether you’re looking for chic, trendy, or somewhere in between, this assortment of formal prom dresses by Clarisse has a variety of styles from which to choose, ensuring an ideal look for every trendsetting fashionista. Be red carpet ready in a Clarisse dress from this collection of long prom dresses and elegant formal ball gowns. Whether you’re looking for a luxurious satin prom dress or a form-fitting jersey mermaid gown, you’ll find a variety of fabrics, cuts, and colors from which to choose. Long ivory white lace-bodice prom dresses provide an elegant look of innocence, while vibrant-colored chiffon evening dresses are ideal for twisting and twirling, gorgeously amplifying your moves on the dance floor. For a truly one-of-a-kind look, slip into one of the unique floral-print prom dresses and let beautiful botanical blooms boldly highlight your personal style. To achieve a dreamy and dramatic look, simply slip into a curve-cradling jersey evening dress or an off-the-shoulder mikado prom dress with flaring mermaid or trumpet-style skirt. To bring ultra-feminine appeal to your next formal event, try a trendy open-back prom dress or one of the floor-length designer evening gowns gorgeously adorned with intricate beadwork, embroidery, or applique accents. From flirty flounces to rambunctious ruffles, this assortment of designer dresses for prom by Clarisse boasts an array of fashion-forward and classic features, making finding your ideal look a breeze.